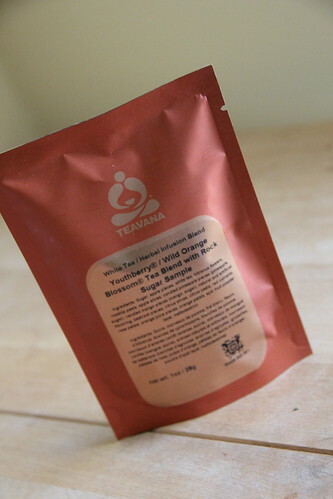 I went through my tea stash the other day and found a sample from Teavana: Youthberry Wild Orange Blossom. I believe it came with my last order. From the label the blend contains: apple pieces, white tea, hibiscus flowers, rosehip peels, candied pineapple and mango, beetroot, cistrus slices and peels, red currants, rose petals, orange petals, orange juice pieces, acai fruit powder and Teavana’s rock sugar. It is available in 4oz increments for $19.96. When I opened the package I smelled the citrus most strongly. As it brewed I could smell the hibiscus and rose petals. The taste was tangy and citrusy, but sweet. It was a very light fruit tea and I expect it would be excellent iced in the summer, but was delicious as a mid-afternoon pick me up. I subscribe to The Corner of Knit and Tea and enjoy your fiber updates. I also love the cable knit impressed pottery in your photographs. Would you be able to provide a source for buying dishes of the same or similar design? Thanks. I haven’t found anything exactly like the plate I have, which I believe was part of a special limited edition (it was a gift). I do know that there are some nice serving pieces on etsy (particularly this shop: https://www.etsy.com/shop/reshapestudio). There’s also the Sweater Collection by Yedi (http://store.yedihouseware.com/index.php/the-sweater-collection.html). Thank you for your reply. 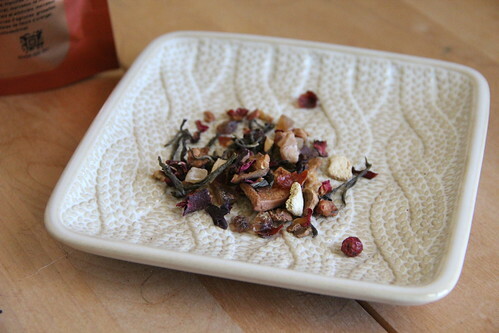 Your pieces are lovely and a true marriage of your knit and tea passions. I started a thread in your Ravelry group page to see if others have suggestions. Previous Teaccessories: Infuse Me Again. Next What time is it? Scarf time.